Officials said the person was hit near the railroad tracks at S. Summit Ave. near E Diamond Ave.
GAITHERSBURG, Md. 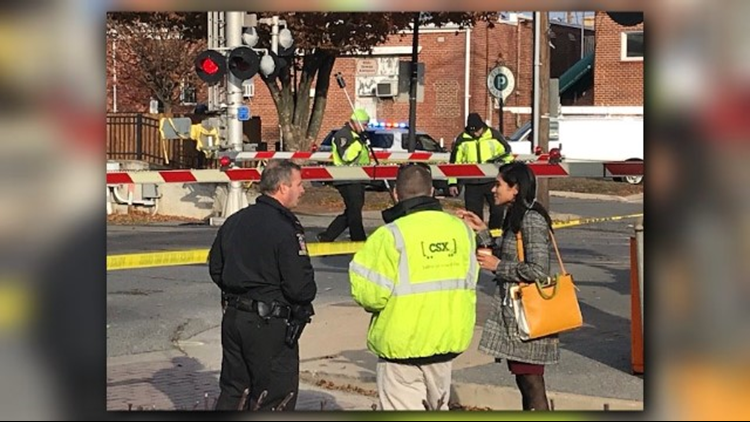 -- A woman is dead after being struck by a vehicle near the train tracks in Gaithersburg Tuesday morning, Montgomery County Fire and Rescue said. Officials said the person was hit by a 2011 Nissan Rogue around 6:45 a.m. near the railroad tracks at S. Summit Ave. near E Diamond Ave. The 52-year-old woman was crossing South Summit Avenue at Wells Avenue in an easterly direction when she was hit by the vehicle. The Rogue drove off, however returned to the scene shortly after. Police said the woman, who has been identified as Li Zhang of North Potomac died at the scene from her injuries. The 29-year-old woman who was driving the Rogue was not hurt. Train service was halted for several hours in the area during the investigation.